This studio (20 square meters) is located on the sixth floor of a larger apartment. There is room for three people. 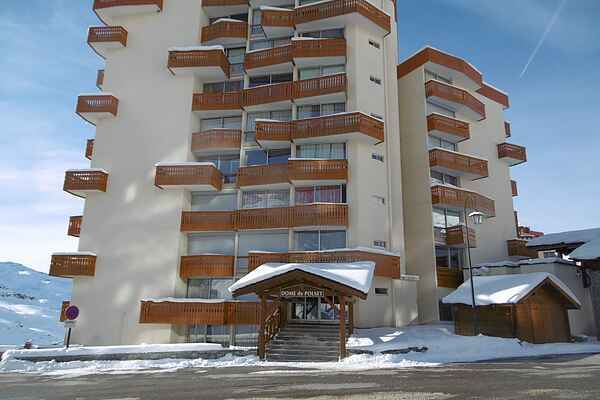 It is 50 meters to the ski slope and also the shopping center is nearby. The balcony faces south-west, so you can quickly enjoy the warm winter and some top up your tan. The kitchen includes includes microwave and vaatwasser.Val-Thorens is the highest ski resort in Europe, the largest portion is above 2000 meters. So you have guaranteed snow, not without visiting two million visitors per year to the region. The village has continued to develop since its opening in 1971. Situated amidst a vast valley surrounded by six glaciers, the resort offers you plenty of entertainment ski routes for a week, whether you're a beginner or advanced. Carving, off-piste skiing, hiking skiing, snow park, boardercross, telemark, there's something for everyone. Enjoy the magnificent views of the peaks of the French, Swiss and Italian Alpen.Er are three areas with ski 's accessible from the resort of Val Thorens - Orelle (150km), the Belleville Valley (300 km slopes) and Les 3 Vallées (600 km of slopes). Val Thorens is also the French village with the most extensive après ski.